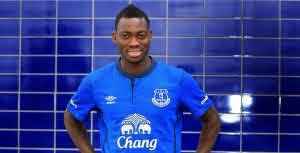 Newcastle winger, Christian Atsu says, he feels depressed with his inability to have his name on the score sheet when they visited Everton at the Goodison park on Wednesday. Christian, 26, on several occasion came close to scoring but could not. As mostly had the ball on his unfavored right foot, having Pickford equal to the task.However, speaking to nufc.co.uk the former Chelsea star revealed he was disappointed not to have scored in the game they opted for a win. "I'm very disappointed that I was not on the score sheet because I had the chances to score.I was prepared for this game and I wanted to score and stay with the team".
" I would have been very happy this ball to be on my left foot because am sure I could have scored it it was". Atsu mostly used as a substitute earned a place in Rafa Benitez team sheet against Everton was impressive but failed to have his name on the score sheet. "We came here to win the game and not to draw the game" But we got a point and we are very happy we didn't lose this game". "I want to give everything for this team and I just need to continue working hard and the next game we will see".